The town of Tournus is on the Saone River in the Saone-et-Loire department of southern Burgundy. the town has a history dating back to the romans, when the raised position above the river made the location easy to defend. 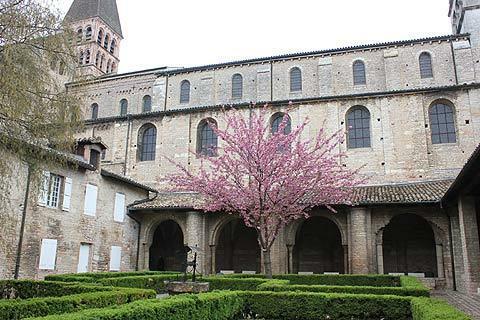 With an attractive and vibrant centre, Tournus is a pleasant town to explore - especially the medieval centre, with its narrow alleys, old stone houses, artsy shops and restaurants. 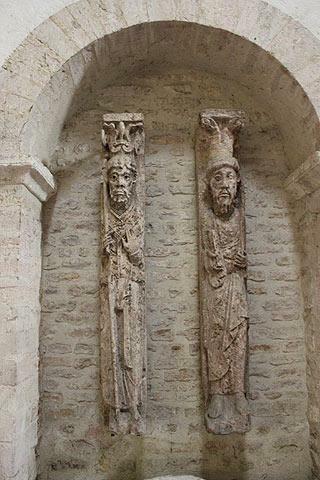 There are also a couple of monuments of particular importance to see - principal among these, and the highlight of a visit to Tournus, is the 10th century benedictine Abbey of Saint-Philibert de Tournus. The town has long been associated with Saint-Philibert, whose relics were brought here in the 9th century when vikings attacked western France, and in whose honour the abbey was built - but earlier than that, in the 2nd century, it was here that Valerien preached christianity (and was beheaded by the romans, hence becoming a martyr), so Tournus has been an important religious centre from a very early time. The abbey church is probably the oldest Roman style church of its kind in existence, and is a very fine building, approached towards the west facade by way of a passage between two oversized defensive towers (which conceal much of the facade until you are quite close).The Saint Philibert Abbey is the only surviving group of monastic buildings dating back to the 12th century which exists in Europe. Inside the abbey church the tall elegant columns and rounded arches lead you to the apse. In Saint Philiberts church a columned path leads around the outer edge of the apse and here you can see some 12th century mosaics depicting the different signs of the Zodiac. In the church there are also some frescoes. 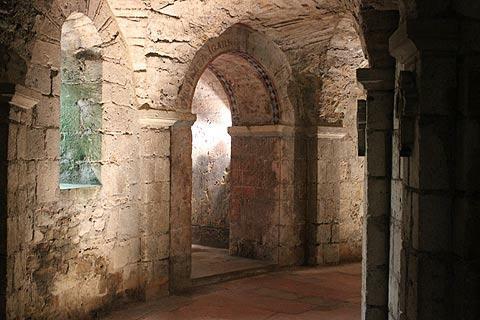 Underneath this area is a very atmospheric 10th century crypt full of arches and columns with carved capitals. The main church also has interesting carved capitals and there is a small kind of museum area off to one side of the church where you can see other carved capitals as well as some wonderful religious carvings. From here you can continue to the cloister which is a large cloister whose centre has trimmed low, shaped hedges and around the edges are attractive round arches. Close to the abbey is the Tour du Portier: this was once a means of access through the wall that closed off the abbey from the rest of Tournus village. 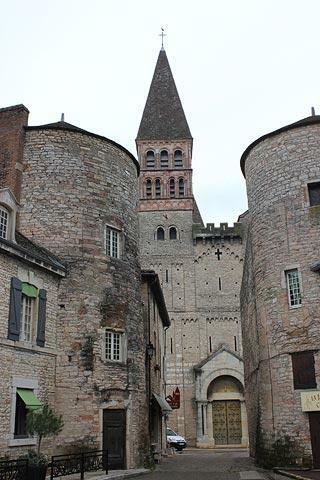 Another highlight in Tournus, well worth a visit (and the 5 euro entrance fee) is the Hotel Dieu. The Hotel Dieu was originally the city hospital and dates from the 17th century. On entering the Hôtel Dieu you arrive in a beautiful building with fabulous stone floors and wooden panelled ceilings. 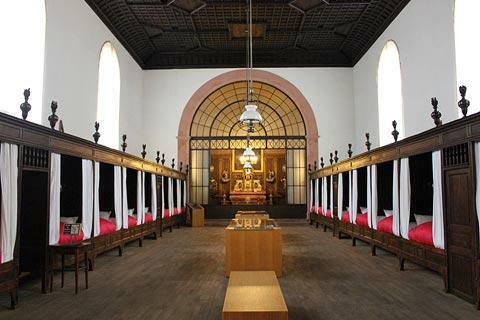 Along the edges of the womens ward and the mens ward are wonderful wooden carved beds, each of which can be curtained off for privacy. The white walls, dark gleaming wood of the ceiling and beds and bright red covers which cover each bed give the room a wonderful simple beauty that I'm sure was not enjoyed in its time of use when many of the beds would have held more than one patient and hygiene was much less exacting than nowadays! There is also a wonderful pharmacy with gleaming wood where glass cabinets hold rows and rows of blue and white earthenware pots, each for different herbs and medecines. 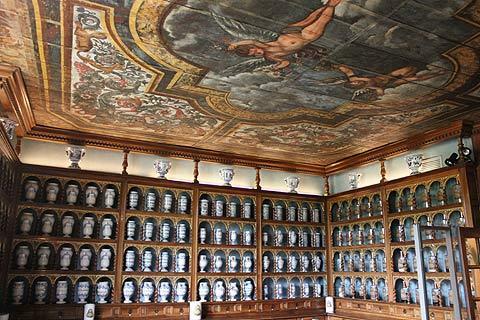 The ceiling is painted with a scene of cherubs in the heavens. The pharmacy is one of the oldest in France. Upstairs some of the hospital rooms have been converted into a museum (the Musee Greuze) featuring a wide range of items relating to the history of the region, and also a good collection of paintings by the 18th century artist Jean-Baptiste Greuze, born in the town in 1725. There are also a number of paintings and sculptures by other artists. 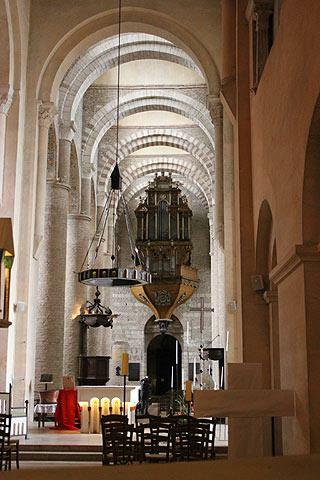 There are several other notable sites in Tournus, including various other religious monuments such as the Church of Saint-Valérien. The Church of Saint-Valérien is believed to be especially ancient, perhaps 10th century, and is a little way north of Tournus town centre, close to the Abbey of Saint Philibert. Heading further south into the town centre, there are also a few medieval / half-timbered buildings that you will come across as you stroll through the town centre - eg in Place Carnot, is the 'Narrow Street' (Rue du passage Etroite) off the western end of the square, and the surrounding streets. 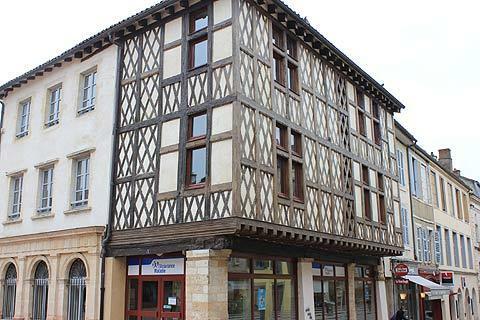 One of the half-timbered buildings in Tournus is the Logis de la Teste Noire near Place Carnot. This building has its first floor overhanging the ground floor. This was common in medieval times and was because taxes were calculated according to how much space on the ground a building occupied! The owners of the buildings tried to get a bit more space in higher levels without it having to be taxed. It is here that we also find the original city hospital (Hotel-Dieu). Continuing southwards you will pass the Town Hall and some more quiet old streets and reach the Church of Saint-Madeleine. 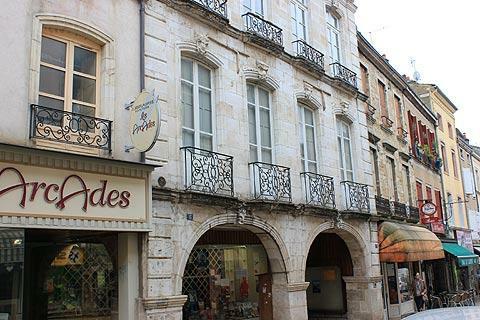 The town hall is an imposing 17th century building and opposite the town hall are two other notable buildings: the gothic house with arcades and the Logis de l'Esgargot with a corner tower. 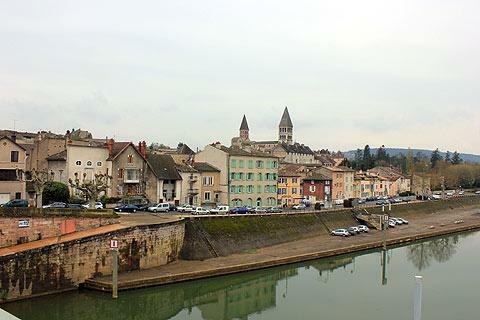 The part of Tournus along the river Saone, which is the eastern edge of Tournus, is also worth a stroll. Cross the bridge for some good views of Tournus across the river. The Tourist Office in Tournus (in the place de l'Abbaye) have an informative plan of the town with a suggested walking route to follow. Note; being a cyclist I was fascinated by the Museum of the Bicycle, which has a fascinating collection of bikes dating back to the early 19th century - before pedals had been invented! (entry charge payable, afternoons only). 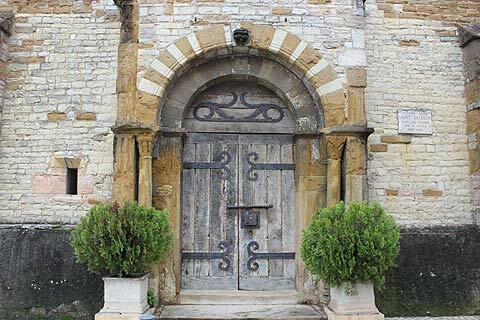 There are lots of picturesque villages and hamlets that you will come across in the countryside around Tournus, many very small but all with their own particular charm - perhaps a particularly quaint church, or a tranquil setting, or far reaching views across the region. The area is surrounded by vineyards and if you want to sample some of the local wines head for 'Les Vignerons de l'Abbaye' just north of Tournus where you can find out about the Burgundy wines and wine tasting. The Nature Reserve of la Truchere-Ratenelle is south-east of Tournus and has a range of different habitats from sand dunes to peat bogs. 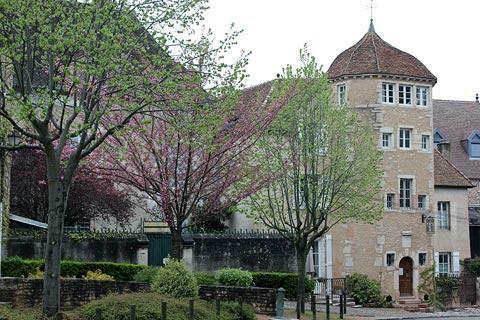 To the west of Tournus you can pass through the village of Brancion and explore the famous abbey at Cluny and the impresive castle at Cormatin.